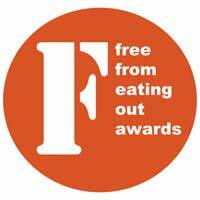 You are here: Home / Gluten Free Finds / When are gluten free products like buses? Wait for a long time… then you get two at once. Not only do we have the new gluten free fish fingers from a ‘normal’ fish finger provider – a break from tradition in itself – we now have two new products from a dedicated gluten free provider. 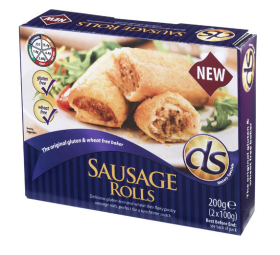 Dietary Specials have announced the arrival of their new wheat-free and gluten-free frozen pastry and sausage rolls. These should be available from Sainsbury stores across the country (UK, I’m afraid) and some people are already reporting that they’ve found them. The press release overstates it a little bit, announcing that this gives coeliacs the chance to enjoy readymade pastry for the first time… this isn’t strictly true, as it has been possible to buy readymade frozen gluten free pastry from a range of different suppliers for a while now (online, from G-Free and Sussex Larder at Johnson’s Provisions or Gluten Free Foods Direct,for example, or on the high street from local providers such as our local shop Just For You) and we’ve been buying readymade gluten free sausage rolls from Lifestyle for years. But it is true that this is the first time that readymade gluten free pastry and sausage rolls have been available in a national supermarket. For some people – perhaps those who prefer to buy from supermarkets, those who don’t want to buy in the bulk quantities sometimes required by online providers, or those who don’t usually buy gluten-free, but need to cater for a visitor – this is a big step forward. Hurrah for Sainsbury and Dietary Specials! Gluten Free Fresh Bread: Go ASDA! I positively drolled when i read of the things you are able to purchase. Living in darkest wiltshire we do not get access to many of the things you have commented on. I also have concerns about manufacturers selling more and more gluten free in supermarkets, this is leading to the government seeking to reduce the prescribable products that we receive. This is fine if you can afford it. Today I treated myself to nann bread in ASDA £1.50 for the same non gluten free product it was 30p. My husband is on a pension and I work part time and simply cannot afford these costs. The bread in the supermarket is £2.95 I receive 6 loaves a month which would be the better part of £18. As a vegetarian also I tend to eat more pasta dishes, pasta in the supermarkets is more than double the price of non gluten free. The prescriptions for gluten free products is the only medical help that the NHS can offer to those of us with coeliacs disease. If there was a pill to take to allow us to eat normally I for one would be more than happy to have it – french bread would be my first food followed by good italian pasta.